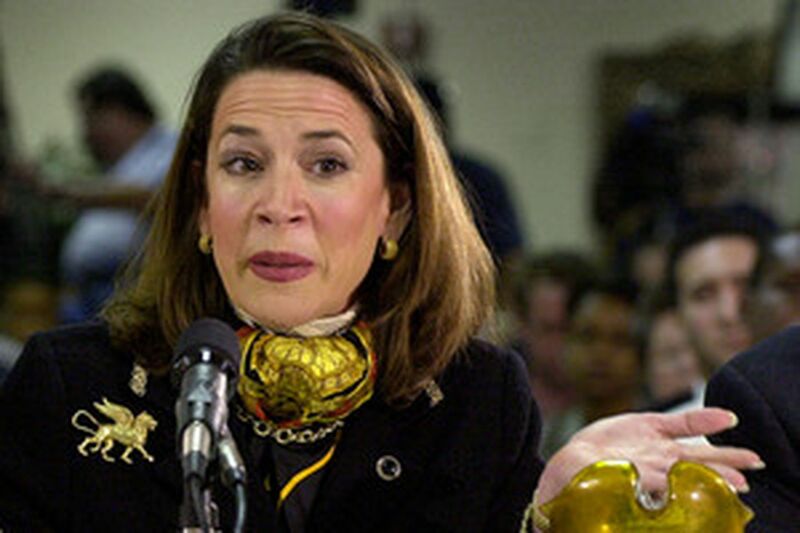 Katherine Harris played a big role in the 2000 presidential election. Sydney Pollack directs an HBO flick about it. "Much as I hate to say this, the notion that we're all done with issues of gender is not right," says ex-CNN analyst Greenfield, yesterday named CBS's senior political correspondent. He starts May 1. "It takes a long, long time for several centuries of behavior to completely dissipate," Greenfield says. "I think people are just starting to realize that gender is a ridiculous limitation in terms of everything but sperm-bank donors." Greenfield has a huge comfort zone at CBS, where he served as media commentator for Sunday Morning from '79 to '83. He's worked twice before for new Evening News boss Rick Kaplan. The big guy recruited Greenfield to CNN in '98 as senior news analyst. And Kaplan was executive producer of ABC's Nightline when Greenfield was its political and media analyst for 14 years, until '97. "Rick and I vibrate sympathetically, like tuning forks," Greenfield says. "We see the news the same." Greenfield's CNN deal expired early last month. His last appearance was Sunday on Wolf Blitzer's Late Edition. The network "made me a perfectly fine offer to stay," he says, but he'd been looking to get out a year ago. Though some say Greenfield's exit was about lack of face time, he denies it. After almost a decade in the 24/7 cha-cha of cable news, he was jonesing to do longer pieces "with a little bit of twinkle." "The irony is that I thought I would do it here" at CNN, he adds. "The nature of cable news is 'What's next? What's next?' Kaplan gets it. By definition, it's very hard to get folks to focus on longer-range stuff." Short-range, Evening News continues to be locked in third place under Couric. CBS didn't hire Greenfield "to fix or change the Evening News," he says. Still, he doesn't deny it needs fixing. Kaplan's hiring "tells you they have a hard job." Couric may have the hardest job of all. Criticized for being too soft, she was accused of being too tough on Democratic presidential hopeful John Edwards and his cancer-stricken wife, Elizabeth, in their 60 Minutes interview last week. Greenfield labels it "a bum rap. Katie asked exactly the same questions everybody else was asking. If she raises her own experience [with her late husband's cancer], people say she's personalizing. If not, she's hiding something." Sexism is at play here, he says, because TV is a venue in which "some people bring a tougher set of expectations" when a woman is on the screen. Couric isn't alone with tough expectations. Everywhere Greenfield seems to work, his job title begins with senior. "It's a kind way of saying 'old.' It means you're ready for the Early Bird special." Who's on first? Remember those pesky hanging chads? Oscar winner Sydney Pollack (Out of Africa) will direct Recount, an HBO flick about the 2000 presidential election debacle in Florida. It's targeted to debut in spring '08. Recount will deconstruct the anxiety-filled weeks after Election Night, when the networks declared Al Gore the winner in Florida, then George Bush, before agreeing it was too close to call. Over the next month, as the country had no successor to Bill Clinton, Florida's then-Secretary of State Katherine Harris became a soap-opera icon as the ballots were recounted. Bush was officially declared the winner by about 500 votes. Obama and Dave. Democratic presidential wannabe Sen. Barack Obama (D., Ill.) will visit David Letterman's Late Show on Monday on CBS. It will be Obama's second Late Show hit. He appeared in November '04, just after his election to the Senate. For the record, fellow contender Sen. Hillary Clinton (D., N.Y.) has chatted up Dave six times, most recently in April '04. Contact TV columnist Gail Shister at 215-854-2224 or gshister@ phillynews.com. Read her recent work at http://go.philly.com/gailshister.